This Rjve freestanding bath adds a striking focal point to your bathroom and doubles as a bold, sculptural work of art. A generous bathing well, dual lumbar support, and slotted overflow accommodate a deep, relaxing soak. The modern design of this cast iron bath contrasts beautifully with the traditional craftsmanship of the dark ash wood base. 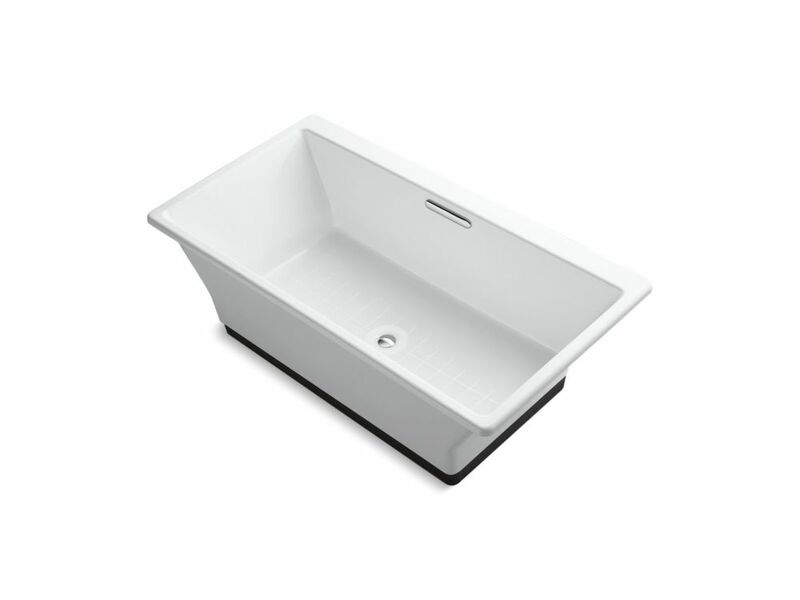 Bring dramatic design and functional elegance to the bathroom with a ProFlex bath. This spacious 6 ft. model offers high-quality acrylic construction for durability and luster, and includes an integral tile flange to simplify installation and prevent behind-the-wall water damage. This model features a right-hand drain. Also available in store by special order only see store for details. The Escale Suite by Kohler takes its inspiration from Japanese ceramic tableware design. A wide range of mix-and-match coordinating products enable the homeowner to create a light modern feel that will continue to look fashionable year after year. This large, 6ft. bathtub is crafted of durable acrylic and is designed for drop-in installation. Also available in store by special order only see store for details. Reve 67 inch X 36 inch Freestanding Bath With Brilliant Ash Base, White This Rjve freestanding bath adds a striking focal point to your bathroom and doubles as a bold, sculptural work of art. A generous bathing well, dual lumbar support, and slotted overflow accommodate a deep, relaxing soak. The modern design of this cast iron bath contrasts beautifully with the traditional craftsmanship of the dark ash wood base.